Products from various countries, be they cherries from Chile, rose essential oil from Bulgaria, or crystal ware from the Czech Republic, can be found in the national or regional pavilions of the China (Shanghai) Pilot Free Trade Zone. So far, 10 such pavilions have been set up on behalf of Australia, Chile, and the combined 16 Central and Eastern Europe Countries, etc., displaying over 7,000 commodities. They have become an important platform for economic cooperation between China and the outside world. According to Wu Yuanfeng, chairman of China Chile Central, the South American country overtook Thailand to become the biggest fruit exporter to China in 2016, with cherries the dominant product. 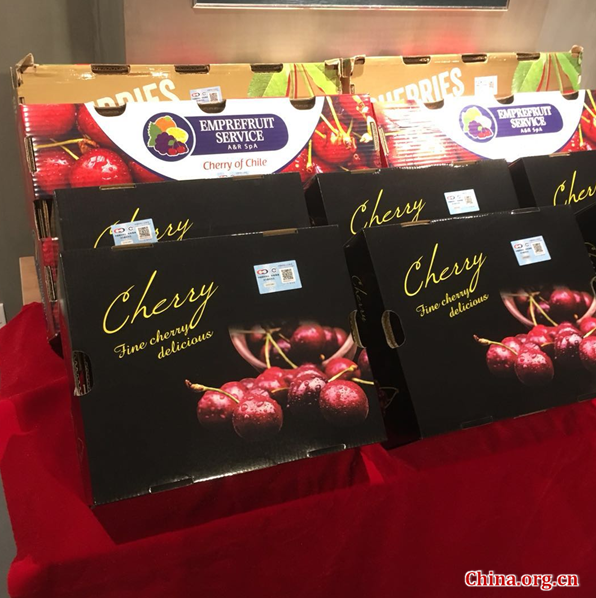 The organization jointly sets the standards for importing cherries from Chile with relevant Chinese authorities, ensuring domestic customers easy access to fresh fruit from the other side of the Pacific Ocean. Wu said the success of Chilean cherries serves as a good example. "Some [other] South American countries want to sell their goods to China," he said. Wu also disclosed that countries including Colombia and Argentina have expressed their intention to join the pavilions. These pavilions also lower the threshold for small and medium enterprises from other developing countries to enter the Chinese market. Besides, they help Chinese enterprises go global. The China Australia Central has helped a company from Wuxi City set up a joint venture company with a nursing home in Australia. "The pavilion is an incubator not only for foreign goods entering China, but also for Chinese enterprises going global," Wu added.